The idiosyncratic abode, a vision of one man, is a Desert Hot Springs landmark. Cabot's Pueblo Museum, a National Register of Historic Places landmark, is located in Desert Hot Springs. HOUSES OF MEMORY: The just-wrapped Modernism Week is the stylish centerpiece of the desert resorts' winter season, a social-strong celebration of mid-century architecture, and mid-century everything else, that draws fans from all across the world to Palm Springs. But just a bit north is a home that was already around when all of those mid-century abodes, complete with sparkling swimming pools, sprung up around the Springs. 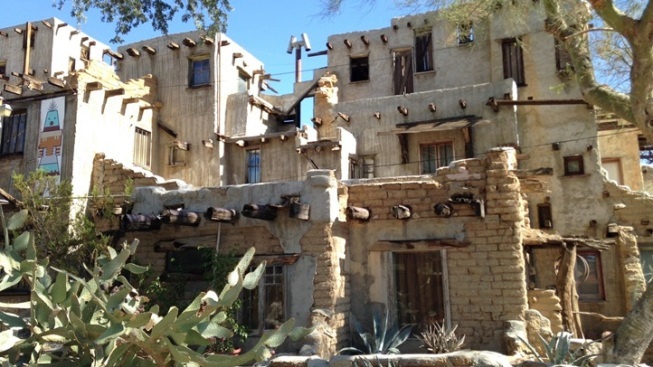 The abode is in a different Springs -- Desert Hot Springs -- and it is as storied as the man who built it: Cabot's Pueblo Museum. The sprawling structure, which is listed on the National Register of Historic Places, was the vision of Cabot Yerxa, an adventuresome homesteader who took part in the Alaska Gold Rush before making for the region now occupied by the desert resorts (with a few other near-and-far stops along the way). Mr. Yerxa began to construct his now-famous pueblo in 1941, but to call the undertaking a multi-year project is to not give full credit to the many years the building took (the visionary passed away in 1965, and the pueblo's site says he was still working on his dream at the time of his death at age 81). If tales of buildings that took years to come together, via one man's vision, out in the desert, intrigue you, you're in luck: The museum offers info-rich tours for much of the year. EXCEPT FOR SUMMER: It can get a mite toasty in Desert Hot Springs 'round about July, rumor has it, and the pueblo is not air-conditioned (though it boasts 150 non-matching windows, all of which were reclaimed by Mr. Yerxa from various sources). So visiting in the Springs in the spring is the way to go, before the museum shutters for the warm months. You'll walk through several rooms of the pueblo, though not all, but the nooks visited will give you a view to life in the home -- there are even a few delightfully incongruous sights, like a blue mid-century bathtub Mr. Yerxa installed for his wife. The grounds boast winding paths, artworks, and desert shrubs like the oh-so-odoriferous creosote bush, which is the very smell of the desert when it rains. SO... does Cabot's Pueblo Museum have anything in common with the mid-century gems a half hour to the south, across the 10 Freeway? Well, in spirit, perhaps. Architecture that lasts does benefit from a visionary with spirit, a love of location, and can-do on its side. The desert has had such visionaries in plenitude, working in multiple building styles, which makes the area a stand-out, stylistically, on several levels. Plus, those mountains, sunsets, and the creosote -- Palm Springs to Desert Hot Springs, it is a place brimming with beauty, even beyond its interesting buildings.